Ottawa mortgage rates are driven by the nation’s most competitive broker market per capita. What follows are the lowest rates from providers with offices in or near Canada’s capital. For providers outside of Ottawa, check the best rates in Ontario. Mortgage Market Overview: Ottawa has one of the highest concentrations of mortgage brokers per capital in the country. That creates a vigorously competitive rate market, fuelled further by local lender Alterna Savings and the Big 5 banks. Ottawa homeowners are also above-average users of rate comparison website, including this one, which makes them saving mortgage shoppers always on the lookout for the best rates. City in Brief: Ottawa is the capital city of Canada, situated on the banks of the Ottawa River in eastern Ontario. 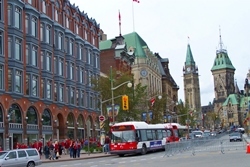 It is the fourth largest city in Canada and has the largest population of university-educated residents. The city’s annual tulip festival is known as the world’s largest and showcases more than 1 million tulips to more than 500,000 visitors.